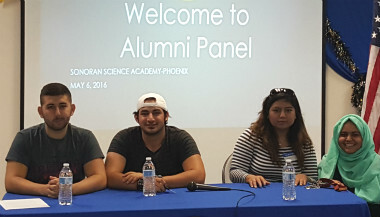 Student information sessions at Arizona colleges and universities, including Arizona State University, University of Arizona, Northern Arizona University, Grand Canyon College, Reserve Officers’ Training Corps and military, Embry-Riddle Aeronautical University and others. In- and out-of-state trips to colleges and universities. Senior college & financial information sessions. We host representatives from colleges to talk about their admission process and financial aid topics. SAT and ACT college admission test practice sessions four times a year. Greater Phoenix National College Fair at Phoenix Convention Center. This is a great free event for parents and students to visit representatives and meet with admission officers from 170 universities and colleges..
PSAT/NMSQT test opportunities for all 9th,10th & 11th graders. On February 25, 2008 the Arizona State Board of Education approved Education and Career Action Plans for all Arizona students grades 9-12. An ECAP (Education and Career Action Plan) reflects a student’s current plan of coursework, career aspirations, and extended learning opportunities in order to develop the student’s individual academic, career goals and postsecondary plans.